50% off first exam does not apply to Exotic exams. 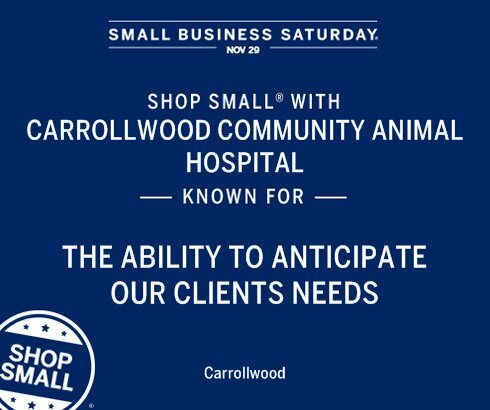 Carrollwood Community Animal Hospital is a small one doctor practice in the heart of Carrollwood located in Tampa, FL. We are a full service animal hospital providing routine care, boarding, surgical and dental services as well as handling emergency cases. Dr. Jones is experienced in all areas of animal medicine from allergies and skin issues to ailments related to genetics and aging. At Carrollwood Community Animal Hospital we believe our clients and patients are more than just a number, you’re family! Our goal is healthy pets and happy clients. We achieve this by really getting to know each family and animal entrusted to our care, and going the extra mile to meet their needs. From the moment you walk into our hospital you will be greeted with friendly faces in a comfortable space. We pride ourselves on the individualized attention we provide to each pet knowing that every patient is different and deserves a wellness plan built around their problems and lifestyle. We have a variety of information available for you regarding your pets’ health including vaccines choices, nutrition, elective procedures, heartworm, flea, tick and intestinal parasite protection and prevention.